Worldwide Timber Traders supply 90mm cold roll formed, screwed steel framing! We made the decision to expand into steel framing so we could offer the complete pre-fabrication package. 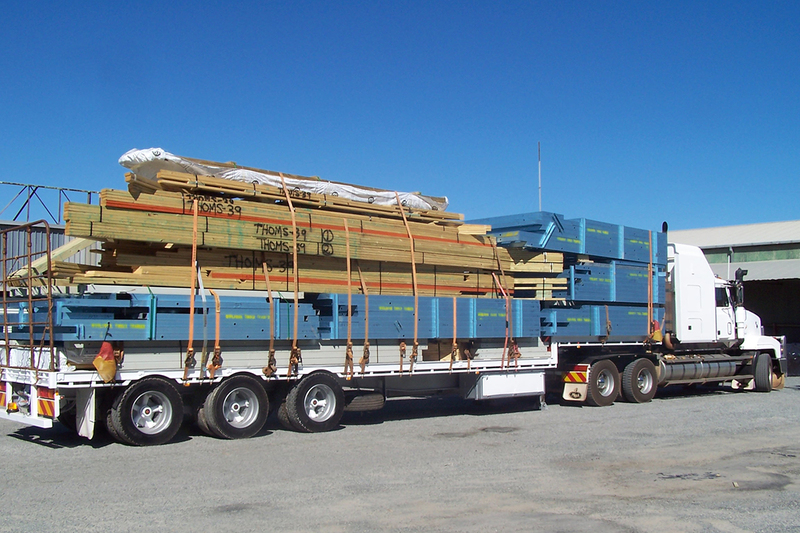 Completely steel framed, or a combination of timber and steel, it presents no problems to our experienced staff. The Steel Framing Department at Worldwide Timber Traders employs Estimators and Designers with a wealth of experience in steel framing and pre-fabrication. This allows for accurate in-house quoting of your steel frame requirements from plans and drawings. 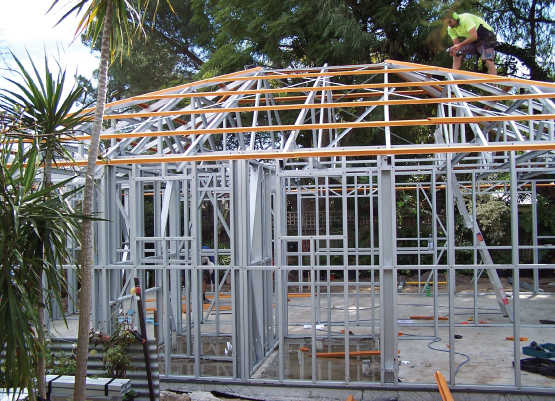 We can then work through the process to create a steel framed solution for your specific needs. Scroll down to read more about our Steel Framing. There is no welding – which burns away the zincalume protection, then relies on a spray paint touch up. Screws achieve a greater strength than the riveted system and if required can be removed and refixed. Australian steel is world recognized for it’s quality and consistancy. Bluescope’s coil steel material is manufactured to meet AS 1397 for which it is regularly tested to ensure uniform product quality. Zincalume Steel which is highly durable has the strength of steel and the stable qualities of Zinc and Aluminium. Worldwide Timber Traders’ cold roll form 90mm Zincalume lipped “C” channel in 0.75/1.00/1.15 material thicknesses. The 12mm lip gives 60% more strength than unlipped. The cold roll forming process does not affect the ductile strength of the steel or compromise the protective coatings. 90mm wide frames offer more strength than 75mm wide frames potentially saving money by being able to reduce the thickness of the coil used to produce the channel. Wall frames that are 90mm wide allow you to install thicker batts of insulation in the space between studs which increases the thermal rating of your walls allowing the building to achieve a greater energy efficiency star rating. 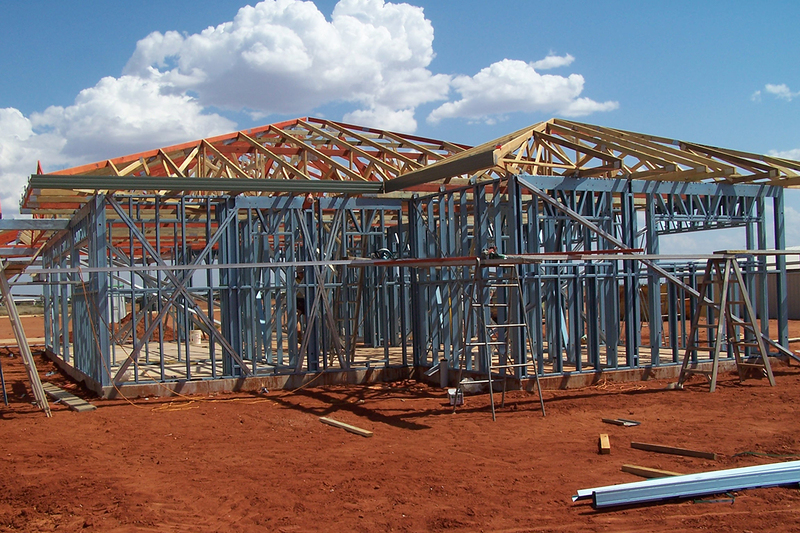 Termites and European House Borer have no affect on steel framing. Steel framing is produced without organic pesticides, preservatives or glues making it a low VOC material. It also does not absorb moisture which can contribute to the formation of mould in your roof space and cavities. 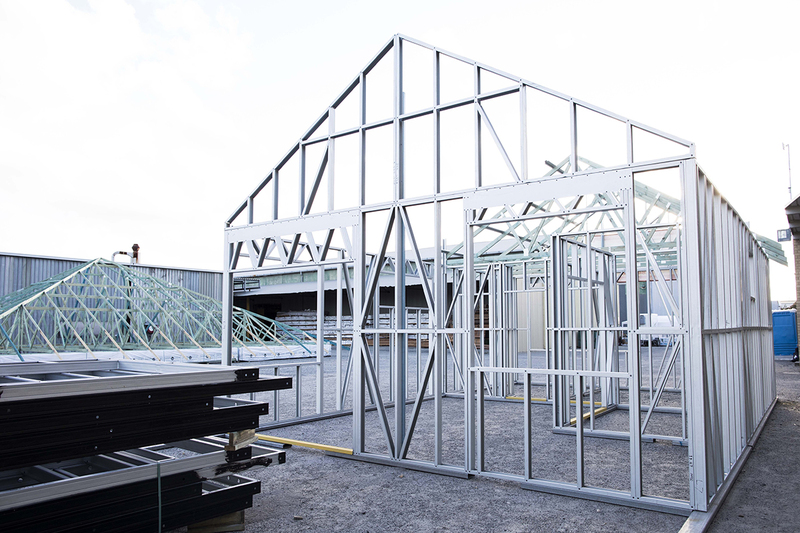 Prefabricated frames for floors, walls and roofs reduces site installation times and allows for quicker builds which means less time on site for the structural trades. Less time on site also reduces the risk of inclement weather holding up the job. The design software labels all the walls and we supply printouts for installation, which are easy to follow.The 90mm channel used in the bottom plate is pre punched for tie down bolts and incorporates service holes for plumbing or wiring, doorways are notched to make it easier to cut out, and frame bottom plates comes pre painted with Bitumen Paint. 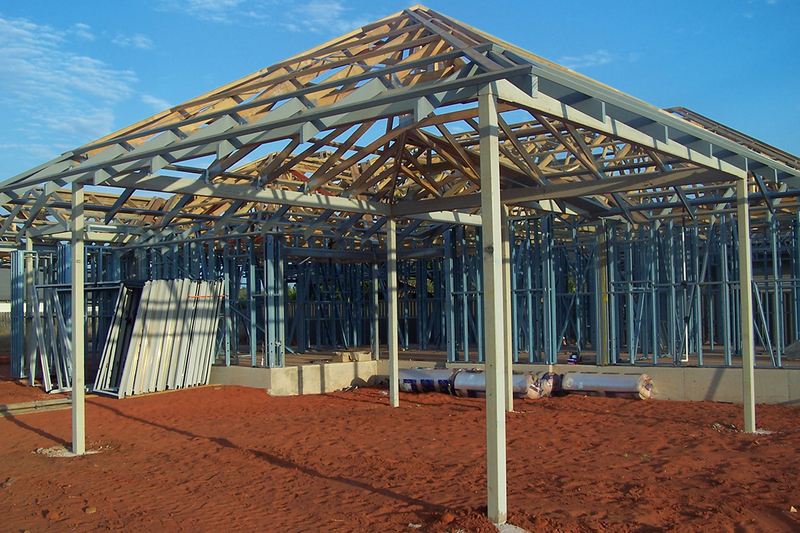 Steel framing is produced without the need for organic pesticides, preservatives or glues making it low in VOC chemicals and the building material of choice for Asthmas sufferers. It also does not absorb moisture which can contribute to the formation of mould in your roof space and cavities. Termites and European House Borer have no affect on steel framing so you can sleep sound that the structure of your building is not being attacked. A growing concern throughout the world is the amount of landfill being created by demolishing out of service buildings. A great deal of these buildings contained arsenic based preservatives which must be sealed off when buried so as not to effect ground water. All new steel produced in a steel mill must use up to 30% recycled steel to produce good quality steel. 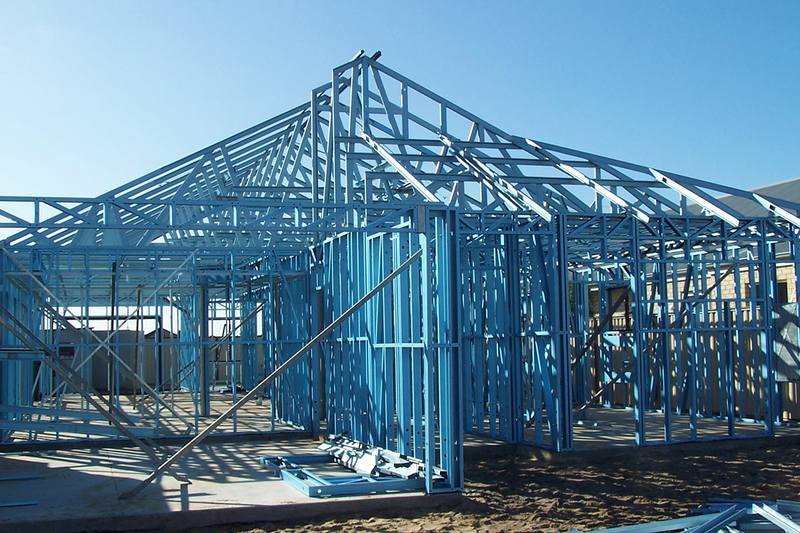 Prefabricated Steel framing is the most economical of all building systems due to the efficiency of the product and process. Less material is needed to complete the structure, while roll forming means not having to cut what you need from standard timber lengths and wasting the rest. Building sites assesed under AS3959-2009 BAL-FZ sites are those considered most at risk of bushfire attack and any structures built on them have to be assesed and certified. Structures in these zones can benefit from using non-combustible materials, as a structural building material steel will not contribute fuel to the spread of a house fire.